The US and UK are about to attack Syria. By now we have all heard that America wants to do something about the Syrian situation. There are a few points to keep in mind about the whole situation. 1. America does not care about Muslims dying in Syria. If anything their logic so far has been beyond sane human understanding. It goes something like this. To Bashar Al Assad they have said: You can kill as many people as you want, but you cannot use Chemical Weapons to kill them. That would be a red line. Regardless, the Syrian Army has crossed this line before. This time however, social media has provided clear videos as proof of this attack. 2. It is highly likely that America is going to spin this to win support from the gullible within the Muslim world as if they are doing a great humanitarian duty by attacking Syria. 3. America is worried about the future of Syria. America does NOT want Chemical Weapons (or weapons of any type) in the hands of Mujahideen. American policy makers are aware that they dont have any friends among the rebels in Syria. The main source of rebel armament is the Syrian Army itself so far. On numerous occasions rebel units have over run Syrian Army check posts and barracks as well as ammunition depots and have been able to procure weapons in a purely Guerrilla Warfare fashion. Youtube is full of videos of Mujahideen showing their maal e ghanimah (war booty) in this fashion. 4. America could itself be behind the Chemical attack inside Syria. This needs to be looked into. a) I m not saying that the Bashar regime is not capable of such a heinous crime. They most certainly are capable of this and they probably are the ones who are responsible for this attack. However the Americans are not incapable of such an attack either. They have zero morality when it comes to their interests and are the only nation on Earth who have used WMDs in war against civilians in the past. b) Why would America want to do something like this? So that they can take out Chemical Weapon sites in Syria. They know Bashar is weak and dont know how long will he last for. So its important to destroy all stock piles of Chemical Weapons before it gets into “wrong hands”. 4) In view of all this some final points should be considered. a) American will not destroy Bashar Al Assad’s regime with such strikes but rather strikes will be limited to Chemical Weapons sites only. Bashar is their man inside Syria (has always been). 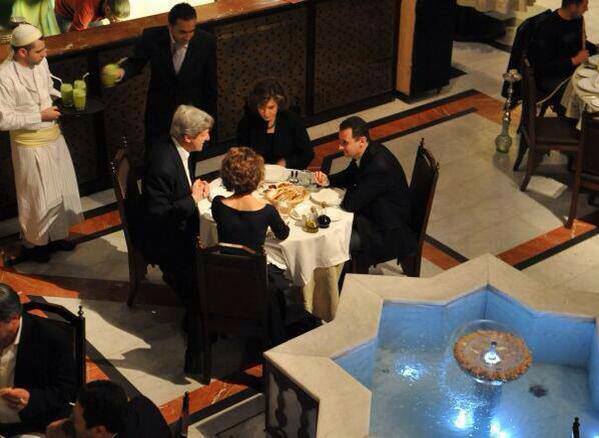 The Kerry couple and the Assad couple dining together in 2009.
b) America will not send soldiers inside Syria rather the attacks will be with the use of Cruise Missiles launched from their ships in the Mediterranean Sea. c) Before America strikes, they ll probably give enough notice to the Syrian regime and there is little possibility of Syrian regime striking back against the US after these attacks. There are some reports that Iranians have warned of attacking Israel in case Syria gets attacked. I dont think the Syrians, Iranians or Hizbollah are capable of such a thing. These are old antics of useless, corrupted and downright evil regimes and organizations. And it is worth remembering that the Assad family regime have been well-regarded in Western capitals – and London and Washington made excuses for them long after the blood-shed started in 2011. The US – despite all its rhetoric – still maintains diplomatic relations with Assad’s government, with US Secretary of State John Kerry personally phoning the Syrian Foreign Minister Walid al-Moualem last week, after these gas-attacks. Make dua for the people of Al Sham. Looks like US and UK have backed down from their plans to attack Syria. A similar analysis from Revolution Observer. Also check out FP article on the Rebels in Syria fearing Americans attacking them along with Chemical Weapons Sites!! !